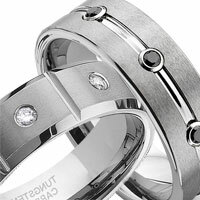 The most classic looking wedding band next to the plain dome ring. 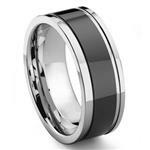 This shiny gunmetal color tungsten carbide ring has a pipe cut profile and comfort fitting. 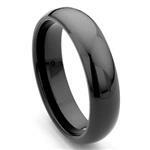 It has high polish finished on the whole ring and made in 6mm in width. The shiny on this ring will last, unlike similar rings made in while gold or platinum, which will get dull and turn color from scratches, the glossy shiny on this one will last a lifetime, and you don't have to worried about taking it off before working with your hands. 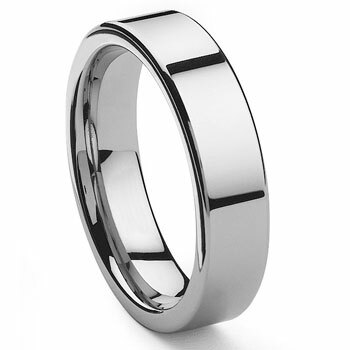 Tungsten carbide is also one of the safest metal used to make wedding ring has it will not bend out of shape and it is hypoallergenic. I ordered this ring and had it in a very timely manner. 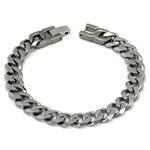 It holds a brilliant shine and is perfect for a man who works hard and uses his hands constantly. My husband is still fascinated by the scratch resistance of it. 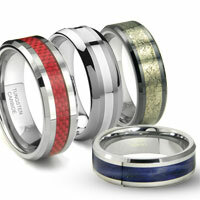 We got the TYCHO tungsten wedding bands with the engraving service, and we absolutely love them. They have a nice dense sturdy weight to them and a very unique and bright shine to them. We get compliments about them all the time! 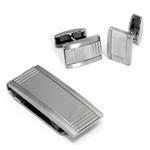 Great quality product, backed by a great warranty and the best customer service to go with it! I bought this ring as a wedding band for my finace'. I was a little hesitant about ordering online. Got the ring in the mail 3 days after ordering, had to send it back for a different size. Customer services was great, kept me updated on the exchange. We had the replacement ring a week later! 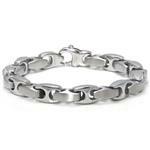 It's a great product and my finace loves the ring! Will definitely recommend Titanium Kay to everyone! We got this as an anniversary gift for the husband. It mimics his Grandfather's ring, but it is better than that! 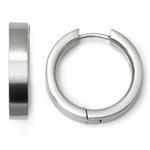 We call this stove pipe design, because it looks like a cross section from a pipe! But this ring is better! 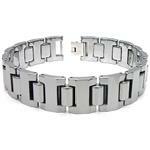 It is very comfortable, made out of Tungsten which won't corrode, and it is very hard, so it is scratch resistant. 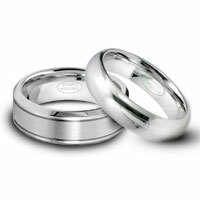 I would recommend this ring as a simple, classy, and long lasting ring for any couple. 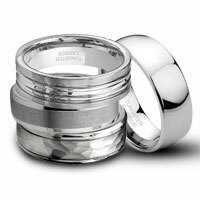 I was terrified to buy a ring off the internet! My fiance is so so picky and the jewelery stores he just weasn't that interested. He didn't want diamonds but he wanted something he never had to take off for his job. When we got the ring I loved it. It was so his personality. 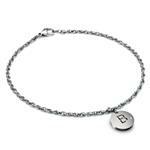 I showed it to him with neverousness but he loved it as well and he didn't mind the price either..lol. He said its just his style and I couldn't have done a better job. The ring is shiner than my 18k diamond ring so definitely worth it. 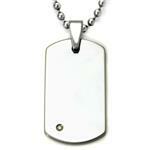 It is an off white but it will never turn yel like "white gold" did some research on the ring quality. I just love it. I would recommend getting a half size bigger since its comfort fit.